Technology has made things easier and more fun to do and every field has not been left behind in embracing the technology. Interestingly, even gardening has its own forms of technology that will make your home gardening much easier. In the modern garden, things that used to be done traditionally or manually can now be done using smart gadgets. This does not only make things easier but it also gives more accurate results which are better for you as a gardener. We'll be looking at the top 10 on this coveted list. It can be depressing to have your plants die on you abruptly. This gadget will monitor all the factors necessary for healthy plant growth like temperature, light, and moisture. It will then send that information to your phone through Bluetooth. It gives you warnings when something is not right with the plant. Areas that wild animals or other domestic animals roam around freely can be hard to keep a fruitful garden. This gadget is the modern scarecrow that has motion sensors and sound to scare away the animals. It also has water splashes that go off abruptly scaring off any animals that had been sensed by the device. In case you have had low crop yields and want to increase that by about 30% then you need this gadget. It acts like a bee and releases pollen that you can use to pollinate your plants by hand. This gadget will increase your yield with so much ease but with quite a high margin. This one acts like a mini-greenhouse for your plants. It has a mesh top and will protect the plant from extreme cold weather or wind. It has a zipper that you can unzip to expose the plant to direct sunlight making it quite convenient for your plants. Your sprinkler system needs a little upgrading so that it can save you time. This gadget uses an app to set up different parts of your lawn. It will further study your lawn and link it to the weather patterns using that information to create a watering schedule that is perfect for your lawn. You can now watch your garden grow using this garden digital camera with 1.3 megapixels. It will take photos of your garden at intervals of 1 minute for every 24 hours and give you an overview of everything that is happening in your garden. Do you have to water the plants today? That is a question best answered by these gadgets that will give you accurate weather readings in real time. You'll know when the plants need watering and when the rain will do it for you. Keeping your lawn cut and neat just became easier with the robotic lawn mower that can do the job unmonitored. You just need to show it where to cut and it will do the job for you. After it's done your lawn will be clean and cut uniformly even under that white cantilever umbrella on your garden. Are you having trouble deciding which plants to plant on which patch of your garden? You can plan it out on your iPad. This one comes with the ability to draw and plan your garden and also information on the best plants to plant given the weather conditions in your garden area. When your things are organized, your gardening tends to get better and way easier than it would be if everything was everywhere. A wheelbarrow is a necessity in the garden. You do not have to throw in sensitive items together with hard items anymore. Hobbies should not be hard and give you a hard time. Gardening is one of the many hobbies that involve a lot of work but it doesn't have to be that hard anymore. 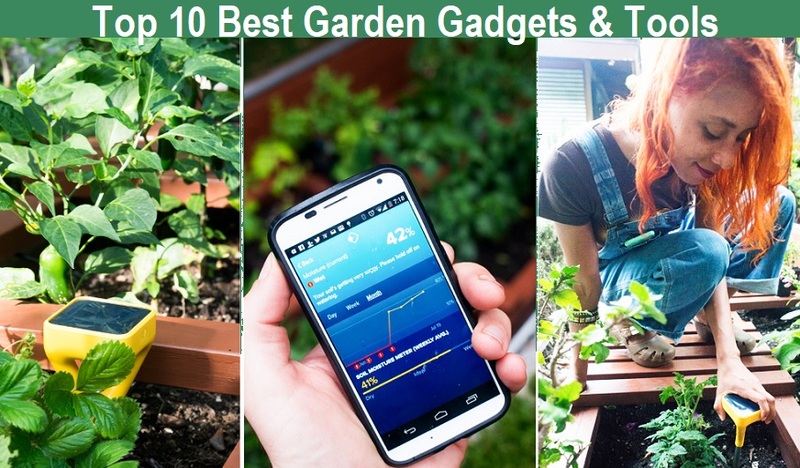 Invest in these very useful gadgets and gardening will never be the same again. Technology keeps getting better and in the future, you might be able to do your gardening entirely from the comfort of your home or your office. There are more gadgets to this list but the above listed are the ones you cannot afford to not have.